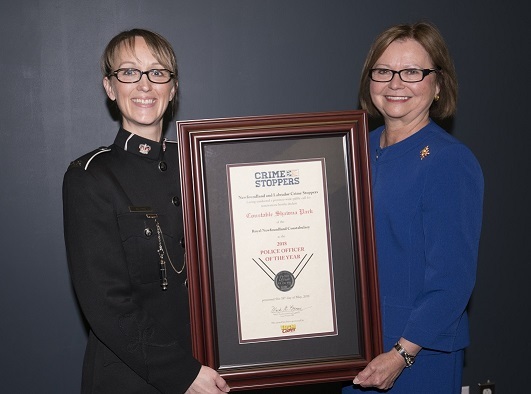 February 25, 2019, Newfoundland and Labrador Crime Stoppers have been proud to honour men and women of our police services who go above and beyond their daily duties to ensure our communities are safe, and contribute to the betterment of our province. Typically, Police Officer of the Year Awards (POYA) is an annual event that provides the forum to recognize outstanding officers. Unfortunately, NL Crime Stoppers will not be holding the event in 2019 as we take time to evaluate the program. Newfoundland and Labrador Crime Stoppers would like to take this opportunity to thank all the officers who no doubt work diligently to ensure safety and well-being of our communities. Started in 1992, Newfoundland and Labrador Crime Stoppers is a community based program and registered charity that brings the public, the media and law enforcement agencies together in cooperative effort to help solve crime. This is accomplished by offering cash awards and guaranteeing anonymity to persons who furnish information leading to the arrest of or laying of charges against criminal offenders. 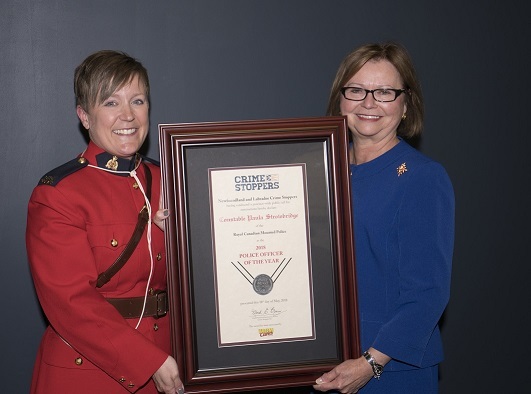 May 23, 2018 – On Friday, May 18, 2018, Newfoundland and Labrador Crime Stoppers presented the 2018 Police and Peace Officers of the Year Awards (POYA). The ceremony was held at the Manuels River Hibernia Interpretation Centre with finalists and family members, executive from the respective executive organizations and invited members of the community in attendance. “For over 22 years, Newfoundland and Labrador Crime Stoppers has taken pride in honouring officers in our province that go above and beyond the call of duty to make our communities and province a better place to call home. Again this year, the awards program represents all the enforcement entities in the province, police and peace officers and we are delighted to recognize these outstanding enforcement officers,” said Mark Brown, Chair of NL Crime Stoppers. The 2018 Police and Peace Officer of the Year Awards are proudly supported by the VOCM Cares Foundation. Started in 1992, Newfoundland and Labrador Crime Stoppers is a community-based program and registered charity that brings the public, the media and law enforcement agencies together in cooperative effort to help solve crime. This is accomplished by offering cash awards and guaranteeing anonymity to persons who furnish information leading to the arrest of or laying of charges against criminal offenders. 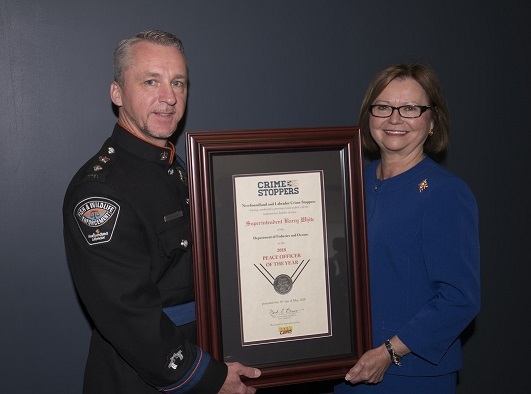 The 2018 Police and Peace Officer of the Year Awards is proudly supported by the VOCM Cares Foundation.